The DeLorean's long been associated with technology and performance, despite being saddled with a French-Swedish powerplant that made those associations slightly laughable. This weekend I drove the Electric DeLorean. I'm not laughing anymore. This weekend was the International DeLorean Owners Event in Houston, Texas. Lovers of the stainless steel sports car assembled at the HQ of the DeLorean Motor Company (DMC), the modern version of the company that reigns over a kingdom of spares. DMC used the event to present its devoted fanbase with a prototype vision of the future: the electric DMCEV. They've removed the underpowered PRV V6 guts and replaced them with a 260 hp (equivalent) electric motor. Its interior gets updated with some modern switchgear and electronics. I was told, to really appreciate it, I had to drive it. So I did. "Turn the key until you hear the click, then turn the center dial over to 'D'" DMC president Stephen Wynne tells me. Honestly, I'm still buzzing from the sensation of closing the stainless steel gullwing door just moments earlier. I twist the key and rotate the surprisingly weighty metal dial. Silence. I press the gas pedal, which, true to form with any 1980s exotic, has so much resistance it's more like a piece of gym equipment. Press harder, and we silently glide forward. Wynne and I are on a 3/8 mile oval track that I didn't know existed in Houston until about 15 minutes ago. He calls this DMCEV "version 0.9" — a not-quite-1.0 working prototype that the company has been dreaming of for years and testing for a few months. It has some amazingly trick parts, including an integrated iPhone dock inside and a hinged grille up front that opens to reveal the charging port. It's being developed with the fittingly-named Flux Power, a California battery systems company launched by a co-founder of Aptera. In testing around southern CA, this prototype has had a range of 70 miles "comfortably" and closer to 100 miles when driven extra efficiently. That's Nissan Leaf territory. I drove a couple laps slowly, getting a feel for the firm, weighty steering and heavy effort needed to push both pedals (even the parking brake requires some force). Wynne, grinning, encourages me to get on the power hard on the next straightaway. 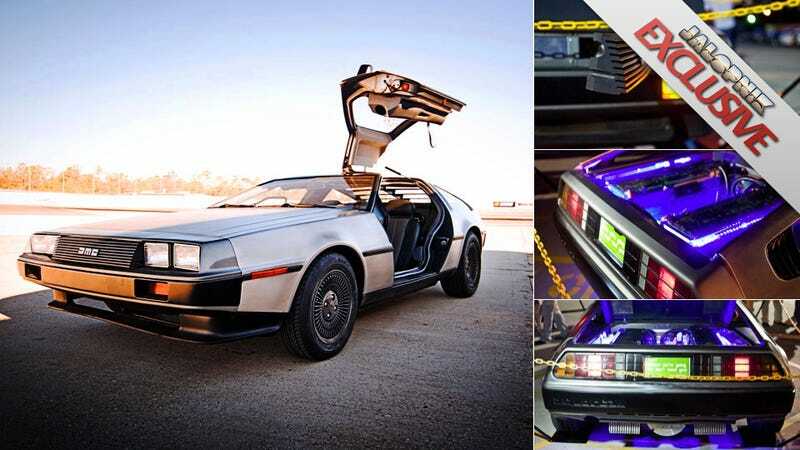 When someone gives you permission to go all Daytona USA in an electron-powered DeLorean, you just turn your brain off and do what the man says. I grip the thick, DMC-customized Momo steering wheel tighter and open up the throttle throttle as we exit the banking. It surges forward. It feels like a car carrying bit of weight, but now with more than enough torque to overcome its heft. We whisk down the too-short straight and arrive almost instantly at the next corner without making sound. This is making sense. If the DMCEV can do 0-to-60 mph in 4.9 seconds as DMC claims, it will finally pack the performance that the Giugiaro body has been promising all these years. If the DMCEV can maintain such performance while producing a reasonable range it'll be an accomplishment given the electric system adds about 200 pounds to the weight of the car, despite the lack of engine and transmission. DMC plans to offset this with a an all-new resin infused composite underbody they've developed with Epic EV that is hundreds of pounds lighter. The battery positioning also helps improve on the rear-biased 35%/65% weight distribution of the standard DeLorean. The motor in the prototype is a DC-type, but the next prototype will move to regenerative AC technology, which will boost efficiency further. We pull into the pit after a few more laps, and I notice some of the squeaks they told me about coming from the interior. One downside to a silent motor is that they're discovering new sounds that previously went unnoticed. "I'm afraid someone's going to steal it," Wynne says with a laugh. "They'll just drive it right out of the shop and won't hear it leave!" A proper, factory-backed electric DeLorean makes so much sense that it seems like the destiny that this timeless-1980s icon was always meant to fulfill. It's impossible to find a review of any electric vehicle that doesn't hail it as "the future." Yet the most futuristic of all of these electric cars might be one straight out of the past.